Detailed.com bills itself as a site filled with “content marketing case studies you can actually use” so let’s get to work. In this post, we will explore three of Detailed.com’s most interesting case studies and explain how a recruiter could re-purpose the idea for their own content marketing plan. Nick Stephenson’s business is simple. According to detailed.com, he “helps authors get their first 10,000 readers”. His key marketing technique is publishing a free ebook on Amazon that contains helpful tips but not enough information to fully solve his prospective customers’ problems. Once they’ve read the book, they trust that Nick knows what he’s talking about and they sign up for his email list, giving Nick an opportunity to sell them his “Author Marketing Toolbox”. As an experienced recruiter, you probably have acquired many tactics you use on a daily basis. The beauty of experience is that you could likely give them all away to someone else and they couldn’t perform half as well as you until they put in the thousands of hours that you have. Let’s take advantage of this fact. Write a 30 page ebook called “How to recruit in [your industry]” or “How to recruit for [your job specialty]” and publish it on Amazon. Your target audience, hiring managers and HR professionals, are certainly looking for this type of information and you’ve found the one place, Amazon, where you likely will not have much competition for their attention. If you do this, make sure you have a newsletter that people can subscribe to once they’ve finished the book to give yourself a chance to ultimately sell them on your services. Plus, if you write a helpful book and get great reviews, you can point to the reviews as a credibility-building tool in all future sales meetings. People love downward comparisons of their lives to others and because of that trait, they have a constant need to find out about the worst things in a category. A site called Areavibes took advantage of this idea and published an article on the most dangerous cities in the US. It was shared 7,000 times on Facebook. An article on the worst cities to live in was shared 39,000 times. There are two ways I could see this working. First, you could try a sensational headline like “The worst recruiting strategy I’ve ever heard”. This post could start with a story about exactly what it purports to discuss and then transition into almost any topic you’d like. The headline will grab people’s attention and the meat of the post will keep them engaged. Second, you could try a list post like “The top 5 worst answers I’ve heard in a [your industry] interview” where you walk through a standard “what not to say in an interview”-type post but use horrible things you’ve heard people say as the foundation. There are a few potential ways you might implement this idea. If you insist on staying away from linking to competitors, you could create a list of the best recruiters in every industry besides your own. If you only recruit locally, you could write a list of the best recruiters in your own space in every city besides your own. (There might even be a potential reciprocal link scheme here that is worth considering.) 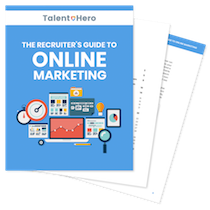 Finally, you could do something more straightforward like link to the best recruiting blogs in your industry.